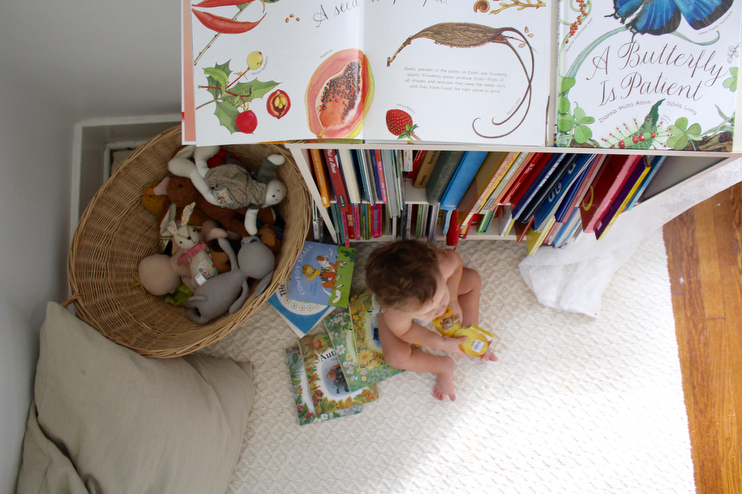 I wanted to give you a little peek into our reading nook in the kid’s nursery because I think it’s just darling. 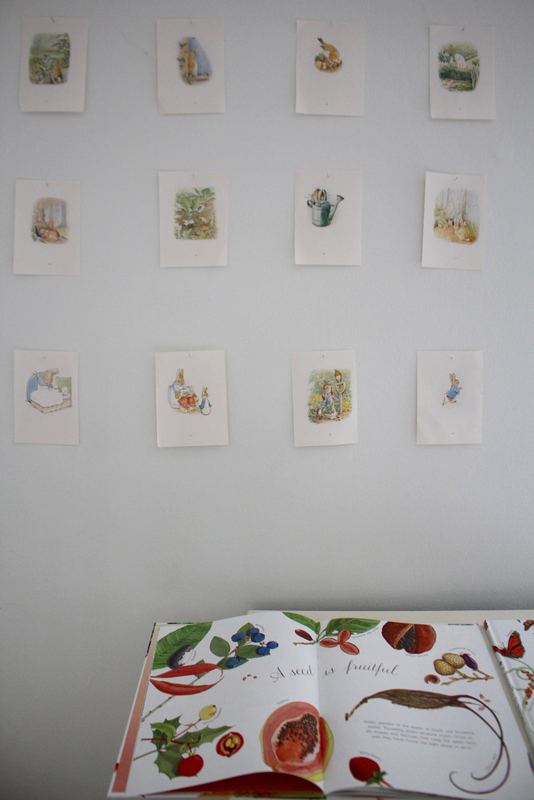 A month or so ago I rearranged Stella and Alfie’s room to make space for reading and playing, an intentional space with a big wool rug, a library cart full of books, soft animal toys, a woven basket housing blocks and cars, and our favorite images from Beatrix Potter’s Peter Rabbit pinned on the wall. This is where we read stories before naps and bedtime, where we talk about seeds becoming flowers, where we learn about the seasons, why cows are called calfs and why the sky is blue. I have found that creating a space just for them to cozy up on the floor with bigger than them feather pillows makes things like reading and block building more inviting and somehow, special. It gives them a place to hunker down with Andrew and I and point out duckies and farm animals somewhere bedsides our beds or the couch. 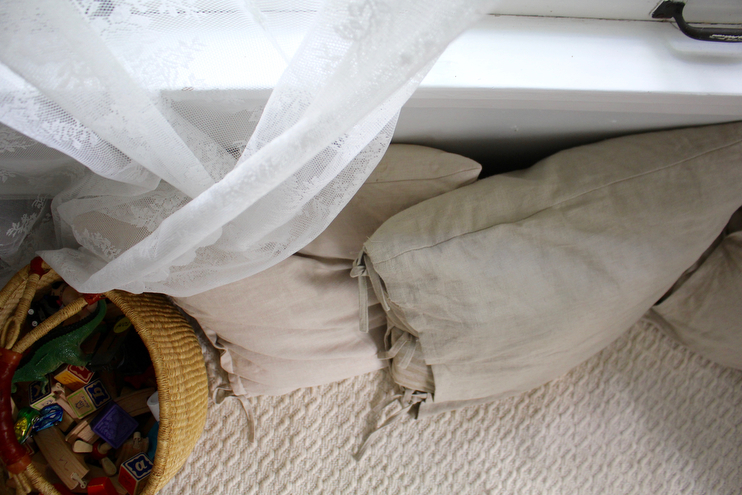 If you have little ones I so encourage you to make a cozy nook for them, it has grown to be a beloved part of our home. And one more thing, you have to get your hands on these beautiful nature-inspired books we’ve been reading all summer long. I think I enjoy them just as much as the kids, if not more! The Seasonal board books are without words, which gives us all an opportunity to use our imagination and make up our own stories, play eye spy, and learn different seasonal objects. The books by Hutts Aston are some of the most gorgeous we own and are also very informative. Happy, cozy reading to you and your little dears. For more little one library ideas, head here. Oh, I love the Dianna Hutts Aston books … thank you for sharing! I noticed there’s a teacher guide you can download to go along with them. Perfect for even my big girl (7). I think you would adore the way Cynthia Rylant writes. Our favorite is “Let’s Go Home: The Wonderful Things About a House.” This might be a great one for you and Stella to share. My girls love pouring over the illustrations that are almost dollhouse-like. I love the imagery of the words.